Nara was the ancient capital of Japan about 1,400 years ago. It is a popular day trip destination from Kyoto and Osaka. This article introduces 10 of Nara's top famous sites and things to do in this shrine and temple-filled city. A Day Trip from Kyoto and Osaka - What is Nara Like? Nara is a part of the Kansai region, and is conveniently located near Osaka and Kyoto, making it an ideal location for a day trip. Over 1,400 years ago, Nara used to be the capital of Japan. As such, only in this city can visitors find historical sites such as shrines and temples which have more than 1,000 years of history. The main charms of Nara are its historical buildings, the best known of which is Todaiji Temple. Nara has an older history than Kyoto which makes it a favorite destination for travelers to visit throughout the year. Although famous temples and shrines such as Todaiji Temple and Kasuga Grand Shrine are located in Nara city, you can also find other sightseeing spots outside of Nara city. We will be introducing each area of Nara and ways of traveling to them one by one. Nara City is located in the center of Nara Prefecture and is an area where there are many shrines and temples. In fact, eight shrines and temples found within the city are registered as World Heritage Sites and are known as the “Historic Monuments of Ancient Nara”. The city as a whole shows the true depth of its fascinating history. Asuka Village located in central Nara Prefecture and just south from Nara city is an area where an ancient palace and historic sites created during Asuka period (late 6th century to early 8th century) still remain. Omiwa, which is one of the oldest shrines in Japan, is also found in Sakurai city in this area. If you want to discover the nature of Nara, head to the Yoshino area. This is the southern part of Nara Prefecture, where Mount Yoshino is located. It is a famous destination to view beautiful cherry blossoms in the spring but also well-known for its other seasonal shades. If you are hoping to visit the major attractions inside Nara City, taking the Grutto (loop) bus is the best. There are two routes to this bus, one which heads towards Nara park route and the other to Heijo Palace. Both of them cost 100 yen per ride. When you go outside of Nara city, taking either JR Nara line or Kintetsu line is the best, depending on where you want to travel to. If you purchase a Nara World Heritage Free Ticket, you can enjoy unlimited rides on Nara Kotsu Bus Lines and Kintetsu lines for anywhere from 1 to 3 days. You can purchase this ticket at any stations of Kintestu Railway. Please visit their official website (English/Traditional Chinese/Simplified Chinese/Korean/Thai) for more details about this pass. A sightseeing taxi is another option to choose from. It is more expensive than others, but you can explore around more freely without having to worry about the last train or whatnot with one. Renting a bike is a good option if you are planning to visit some attractions near train stations. You will definitely discover different characteristics of Nara as you enjoy the fresh air. Nara has a lot of tourist attractions that really make it easy for people to see what the city was like so long ago. Now we will introduce ten recommended destinations and what to see in each place. Todaiji Temple is one of the representative attractions in Nara. It was built in the 8th century, giving it not only a far-reaching history but also prompting it to be recognized as a World Heritage Site. A must-see thing in Todaiji is the Nara Daibutsu (a giant bronze statue of the Buddha) which is one of the three largest Buddha statues in Japan. This statue is thought to have been finished being constructed around 752, making it the second oldest of its kind. The Great Buddha Hall where the giant bronze statue of the Buddha is placed is also stunning. One of the pillars of the Great Buddha Hall has a hole in it which is the same size as Buddha's nostril. It is said that passing through this hole will bring you happiness. Please check it out when you visit Todaiji Temple. Horyuji Temple, constructed in the 7th century, is well known as the oldest existing wooden building in Japan. This temple was home to Prince Shotoku, who was the main politician and one of the first major figures of Japanese Buddhism at the time when the temple was built around 607. Its five-story pagoda is exceptionally popular and also part of the World Heritage Site designation due to their age and high cultural and historic importance. Admission to this pagoda is free. Nara Park is located in the center of Nara city. Within its grounds, you will find shrines and temples, including Todaiji Temple, as well as museums. More than 1,200 wild deer live in the park and have long been considered sacred animals in Nara. You can feed these special deer by buying shika senbei, or rice crackers, sold by vendors throughout the park. In addition to the adorable deer, this park has picturesque scenery all year round, including cherry blossoms in spring, making it an excellent place to visit at any time. Are There Really Deer Everywhere In Nara Park? Yakushiji Temple is a large temple complex with eight buildings within its grounds and is also registered as a World Heritage Site. Its unique architectural style was inspired by Chang-an, the capital of China during the Tang dynasty. The bright vermillion and white colors of the temple are particularly striking. 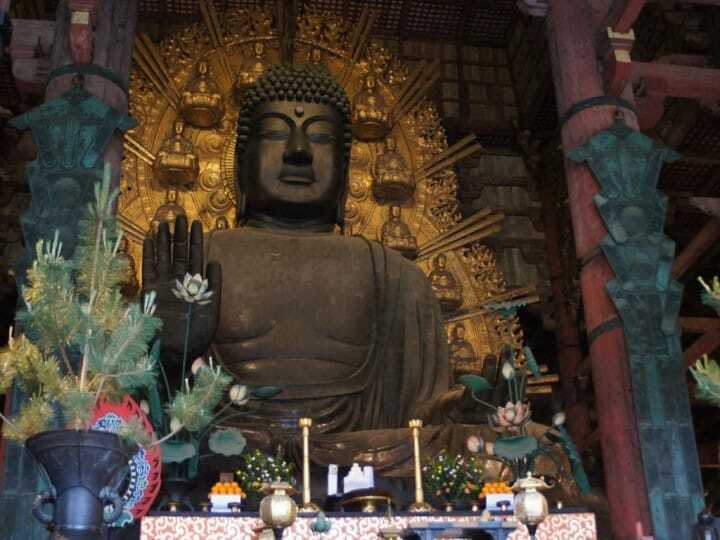 The "Yakushi nyorai" (the Medicine Buddha) statue found here is recognized as a National Treasure in Japan. While this is a must-see, the complex is huge and has many other attractions, like two towering pagodas, so it is a good idea to designate some extra time to this location during your visit. Kasuga Grand Shrine is a shrine built by the Fujiwara family, who were exceptionally influential in Japanese politics around the 8th century. It is an exceptionally sacred site in Japan and numerous Shinto deities are thought to be enshrined here. Also a World Heritage site and considered one of the model shrines of Nara, Kasuga Grand Shrine is decorated with numerous lanterns, giving it a subtle elegance. There is also Shinen Manyo Botanical Garden, a gorgeous traditional garden on the shrine grounds you can visit. Heijo Palace is the site of the original imperial palace in Nara when it was the capital. Unfortunately, the original building was destroyed, but it was reconstructed and now operates as a historical information center, allowing visitors to see what the area was like over a thousand years ago. In addition to a museum and information centers, there is also a traditional garden you can stroll in that provides an example of imperial Japanese design. Its architecture was inspired by the ancient capital of the Chinese Tang dynasty, Chang'an. It is also part of the World Heritage Site List. You can experience and feel the history of Nara for yourself when you visit this spot. The wooden statue of the Boddhisatva Maitreya, a type of Buddha, in Chuguji Temple is famous for its elegant beauty. Chuguji is located next to Horyuji Temple, located south of Nara city. The position of the statue, with its legs crossed and a slight smile on its face, is very impressive and worth seeing in-person. This figure is so well constructed that even with close inspection the seams that hold this wooden statue together cannot easily be noticed. When you visit Chuguji, please make sure to pay this statue a visit. Mt. Yoshino, located in central Nara prefecture, is a magnificent mountain which is best known as a cherry blossom viewing spot, containing around 30,000 trees that blossom. Here you can see 1,000 cherry trees in bloom all at once, which has given rise to the expression hitome senbon which means "a thousand trees at a glance." There is also a cherry blossom festival with vendors selling food and drink you can indulge in while seeing the beautiful sakura, as well as nighttime light up displays. Stunning views can be enjoyed here throughout the year even when it is not cherry blossom season. Visitors can appreciate the hydrangeas during the rainy season in June, new green leaves in summer, fall foliage at the end of October, white snowy landscapes in winter. There is amazing scenery to see at any time of the year. Ishibutai Kofun is a kofun (*1) placed within the Asuka Historical National Government Park in Asuka Village. It is said that it is the tomb of Soga no Umako who used to conduct politics in Nara. You can enter the tomb and experience history for yourself. Only a stone coffin remains now and its surrounding is called the ishibutai (stone stage). The weight of this stone is an impressive 2,300 tons. The craftspeople at the time must have had a high degree of skill in order to be able to move this massive rock. We highly recommend you stop here when you visit Asuka Village. It is particularly beautiful in the spring when the cherry blossoms are in season. *1 Kofun: a mound-shaped tomb that was built in order to house members of high society, similar to a family tomb. Nara-machi is designated as a "Naramachi Urban Landscape Formation Area" and is preserved the historical townscape that was here when it was a merchant district. Within its traditional landscape, machiya (Japanese townhouses built at the end of the Edo period), can be seen freely here. Townhouses in Nara-machi have been remodeled and are now used as restaurants, general goods stores as well as accommodation facilities. Why don't you go inside and experience what Japanese people's lives were like back in the past? Located less than one hour from both Kyoto and Osaka, Nara is convenient as a day trip or weekend away from these popular sightseeing cities. We recommend traveling via train. You can ride either the JR Nara Line or the Kintetsu Railway, depending on what you want to do in Nara. If you are coming from Osaka board the Osaka Loop Line bound for Nishikujo and Nara from JR Osaka Station. At Tsuruhashi Station, transfer to the Kintetsu Nara Line bound for Nara. After around one hour, get off at Kintetsu Nara Station. The fare is approximately 670 yen. If you only want to use the JR train, take the Osaka Loop Line for fifty minutes and get off at JR Nara Station. Be aware that the Kintetsu Railway station and JR station are about a 15-minute walk apart from each other. Kintetsu Nara Station is the closest to Todaiji Temple and Nara Park. For travelers coming from Kyoto, ride the Kintetsu limited express from Kintetsu Kyoto Station. If you ride the limited express, it will cost 1,130 yen and take 35 minutes. You can take the local train for 50 minutes, which costs 610 yen. If you wish to leave from JR Kyoto Station, use the JR Nara Line Miyakoji rapid train bound for Nara. After 45 minutes you will be at JR Nara Station. It costs approximately 710 yen. As the ancient capital, Nara used to be the center of Japan, which means that it is full of cultural heritage and historic landscapes. Close to Osaka and Kyoto, this is a must-visit destination when traveling in Kansai. In Nara, learn about Japanese history at the numerous World Heritage Sites, enjoy the great outdoors and animals, and feel the charms of the old capital.